The success of any salon is dependent on the skill and enthusiasm of its team members, and here at Peaches we pride ourselves on our fantastic team of experienced beauty experts. As well as being a great team, we are a family that we are extremely proud to be apart off. We pride ourselves in professionalism and friendliness and work hard in creating a calming ambiance for our clients to enjoy. Working as a team is a very high priority. We all work well together to ensure that this happens. Therapists are continually training and improving their skills. We have regular group training sessions to keep all of the therapists up to the same high standards. Whether you’re in for an eyebrow wax or 2 hour pamper session, with all of our therapists they will be striving to exceed your expectations on every visit, and you will only receive the best, friendly, and professional care every time! Being the salon owner for the past 15 years, and juggling a busy family life, I have many duties to do, but in the salon, my primary passion is still carrying out our fantastic beauty treatments on our loyal clients. Having been in the beauty industry for over 20 years now, I still love it and love meeting our clients, love performing treatments and still love to learn all the new things that the beauty industry has to offer. I do carry out majority of the treatments on our price list and enjoy them all, they say variety is the spice of life! 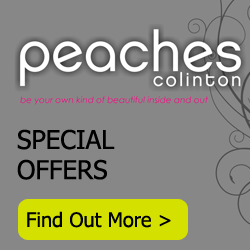 I’ve been a therapist for 14 years, and Salon Manager of the Peaches team for over 8 years now. I love my work, and look forward to coming in each day to see the girls and all our lovely clients. My priorities are to make sure the salon is running smoothly, and clients are happy, relaxed and enjoying their time with Peaches. And I’m proud to say that this is always the case. I take extreme pride in my work and strive for perfection and tailoring each treatment to a clients needs, while making them feel at ease. I have always had a huge interest in the beauty industry from a young age.I started at Peaches as a junior therapist in May 2014 and have gained so much knowledge over my time here from the help of working with clients and the other Peaches girls. I am fully qualified in VTCT Level 3 Beauty Therapy, after completing 2 years of training and I have been full-time in the salon now since October 2016. I love the busy salon life and always keen to keep up with new treatments and the forever changing beauty industry. I enjoy all aspects of beauty and my main priority is always ensuring the client has an enjoyable, relaxing experience in the salon.